Complementary to our surface mount production facility, we are fully equipped to deal with conventional (or through hole) PCB components. This type of PCB can be either mixed technology (SM and conventional) or purely conventional and can be either leaded or lead-free. Despite the wholesale change from conventional to surface mount components, Simtek recognises that due to performance or heat dissipation reasons, conventional components and the associated manufacturing processes will always be a necessity. 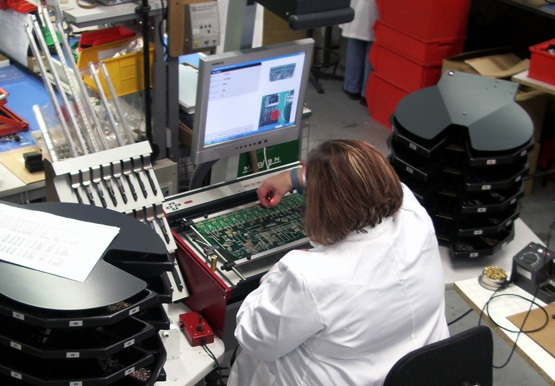 Simtek is therefore committed to supply this type of assembly as part of the complete range of electronic manufacturing services provided. As a result of this philosophy, the manual production soldering processes are augmented by the use of semi-automatic laser guided component placement machines from Robotas Technologies.